I am just confirming i have the layout of the fuel pipes correct - underneath the tank, back right as you are sitting on the bike, there are two small pipes, breather and overflow which line up with the funnel clipped into the frame. On the LHS the front left pipe from the tank goes to the pressure regulator behind the throttle body and then the return line from the fuel injection rail goes back to the pipe on the back left of the tank. I got the bike without any fuel lines so have no reference and any of the photos or schematics i have been looking at are unclear. Thanks for the response - i am pretty new to K bikes so yep i am making up a lot of this as i go along.. I am asking the question a bit badly i suppose - underneath the tank there are two pipes on the left hand side, where the rubber fuel lines attach. These i understand connect to the front of the fuel injector rail and to the top of the fpr, which goes to which? best photo i have found showing it is from here https://silodrome.com/bmw-k75/ - i cannot post photos here yet so 14th photo down, when that power unlocks i can upload some. 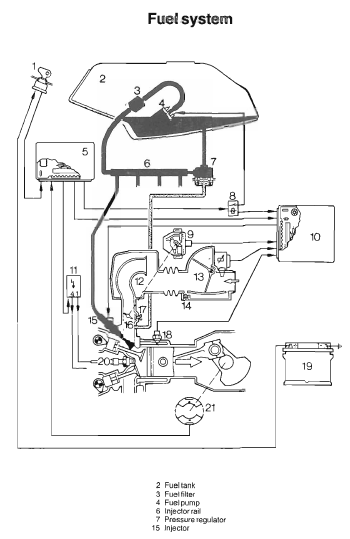 Here's a diagram from an online BMW K75/K100 workshop manual. The pipes are much closer together than drawn here for clarity of their relationship to the system. You should download this manual from the Forum Tech here. It's in the Manuals section. Click the Portal tab to access it. There's a lot of help in the Forum Tech.